Can you explain the difference between contact management and customer relationship management? I recognize software as a service solutions are growing much faster than on-premise systems, however, in absolute terms how much of the market is saas and how much is on-premise? Can you explain the difference between contact management software and customer relationship management software? While I don't believe there is an official or universally recognized definition for contact management software, I will share with you that contact management is generally perceived to be lesser in scope and strategic benefit than CRM. The most popular contact management software systems are ACT and MS Outlook (and neither of these applications are considered CRM software.) Contact management generally includes functions such as account management, contact management and activity management. CRM on the other hand includes the additional Sales Force Automation (SFA) functions of opportunity management, competitive intelligence and the like. CRM also crosses line of business boundaries to include other front office functions such as marketing management, customer support, partner relationship management (PRM) and possibly ancillary functions such as CRM analytics, wireless and mobile solutions and quoting and sales order processing. 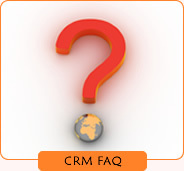 Send your questions to info[at]crmforecast.com.